Home health is a physician ordered service designed to enable patients to maximize their ability to function safely at home by teaching patients and their caregivers how to provide effective, appropriate care. Symptom management, medication management, infusion therapy, wound therapy, mobility, and home safety issues are among the many needs covered. The goal is to assist the patient and caregiver to learn to care for themselves and eventually manage their own care, whenever possible. Medicare, Medicaid or other health insurances may cover the cost of home health care services. You can also obtain care without insurance coverage on a private pay basis. The home health care agency will be able to assist in determining if the services you need are covered or if you need to make other arrangements. A physician, patient or family member can initiate service. However, Medicare, Medicaid and most insurances require physician oversight. Once the physician prescribes home health care, he or she authorizes a plan of care and periodically reviews services and the patient's progress. If a physician does not prescribe home health care, but the individual still desires services, an agency can suggest a plan of care to meet a wide variety of needs and budgets. These services are an out-of-pocket expense. The home health care team consists of physicians, nurses, home health aides, medical social workers and therapists who coordinate care based on an individual's needs. A home health patient is certified for care by his or her physician every 60 days. Most patients are on service an average of 90 to 120 days. However, this varies on the individual patient's needs. Home health care is a short term and if a person needs ongoing care, he or she should seek a long term care facility for placement. How often will I see the nurse and other staff? The frequency of nursing and other staff visits are based on your needs. 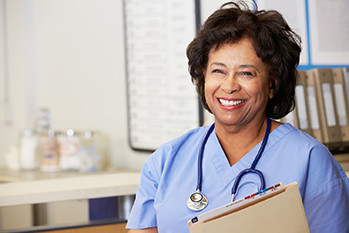 Most patients see a nurse once or twice a week, but many patients may see a nurse daily based on the treatments they receive. Therapist generally will visit you two to three times a week to provide physical, occupational, or speech therapy. If you need a home health aide, you will most likely be scheduled for that service three times a week. Specially trained medical professionals deliver the care. Their goal is to reduce the patient's pain and control their symptoms, resulting in improved quality of remaining life. Hospice care also includes support for the emotional and spiritual needs of the patient and their loved ones. What are the admission requirements for hospice care? What services are included in hospice care? A team of specially trained professionals and volunteers delivers hospice care. The team includes doctors, nurses, social workers, home health aides and volunteers, including clergy who assist the patient and their caregiver who is often a loved one. Medicare, Medicaid and most private insurance plans pay for hospice care. How is hospice care different from home health care? Comfort vs. Cure: For most home health care providers, the goal is to make the patient well. With hospice care, the staff and family recognize that the patient will not get well. They focus on comfort and support rather than cure. Interdisciplinary Team Approach: In hospice, all members of the care team (physicians, nurses, social workers, chaplain, nursing assistants and volunteers) work together to coordinate care. Grief Support: Hospice care does not end when a patient dies. Hospice support staff and volunteers maintain contact with the family for at least one year after the death of a patient. Patients and their loved ones should get involved with hospice as soon as allowable, to take full advantage of the benefits of hospice care. Too often times people seek out care with only weeks or days left, and do not enjoy the quality of life (medically, emotionally or spiritually) that they could have enjoyed had they found hospice earlier in their illness.